Cook pasta according to package instructions; and drain. Spoon half of sauce evenly into bottom of 13x9 baking dish. Mix together 1 cup of mozzarella cheese, ricotta cheese, parmesan cheese, egg and black pepper. 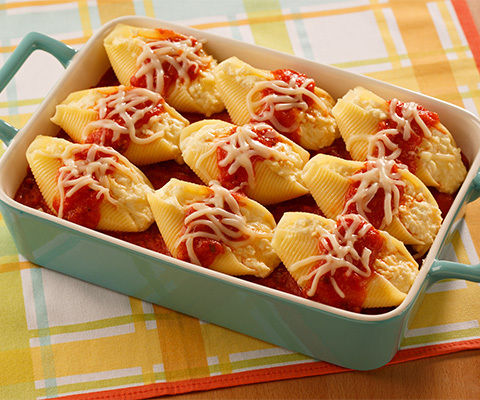 Stuff each shell with cheese mixture and arrange in baking dish seam-side down. Spoon remaining sauce evenly over shells. Cover tightly with foil and bake for 30 minutes. Remove foil and sprinkle remaining 1 cup of mozzarella cheese on top. Bake for an additional 5 minutes or until cheese is melted. Easy to follow recipe and restaurant quality product. I did add a half lb of cooked sausage to the cheese mixture .